Inika Face in a Box Starter Kit - Nurture (Light/Medium) - Bewust Puur! Deze populaire INIKA set is nu verkrijgbaar in een nieuwe en verbeterde editie, en te kopen tegen een absoluut spotprijsje! Verkrijgbaar in verschillende tinten. De minerale blush in Rosy Glow geeft een roze en frisse gloed op je gezicht. De minerale bronzer in Sunkissed geeft de huid een zomerse gloed. Mineral Foundation Powder: Mica (CI 77019);Zinc Oxide (CI 77947);May contain (+/-)Titanium Dioxide (CI 77891);Iron Oxides(CI 77491,CI 77492,CI 77499);Ultramarines(CI 77007). Certified Organic Perfection Concealer 4ml: Aloe Barbadensis (Aloe Vera) Leaf Juice*, Titanium Dioxide (CI 77891), Persea Gratissima (Avocado) Oil*, Simmondsia Chinensis (Jojoba) Seed Oil*, Glyceryl Stearate Citrate, Cetearyl Alcohol, Cetearyl Olivate, Aqua, Glycerin, Butyrospermum Parkii (Shea) Butter*, Theobroma Cacao (Cocoa) Seed Butter*, Sorbitan Olivate, Cocos Nucifera (Coconut) Oil*, Lecithin (Soya)*, Sodium Levulinate, Glyceryl Caprylate, Tocopherol (Vitamin E), Cetearyl Glucoside, Camellia Sinensis (Green Tea) Leaf Extract*, Sodium Anisate, Lactic Acid, Glycine Soja (Soybean) Oil, Cananga Odorata Flower (Ylang Ylang) Oil*, Pelargonium Roseum Leaf (Geranium) Oil*, Cymbopogon Martini (Palmarosa) Oil*, Lavandula Angustifolia (Lavender) Oil*, Terminalia Ferdinandiana (Kakadu Plum) Fruit Extract*, Calophyllum Inophyllum (Tamanu) Seed Oil*, May Contain (+/-) Iron Oxides (CI 77491, CI 77492, CI 77499). Certified Organic Mineral Mattifying Powder 0.7g: Mica, Oryza Sativa Powder, Silica, Tapioca Starch, Zea Mays (Corn) Starch, Gluconolactone, Sodium Dehydroacetate, Sodium Benzoate, Aqua. Mineral Bronzer 3.5g: Mica, Zinc Oxide, May Contain (+/-) Titanium Dioxide (CI 77891), Iron Oxides (CI 77491, CI 77492, CI 77499), Ultramarines (CI 77007). Mineral Blush (Rosy Glow) 0.7g: Mica, Silica, Tin Oxide, May Contain (+/-) Titanium Dioxide (CI 77891), Iron Oxides (CI 77491, CI 77499). 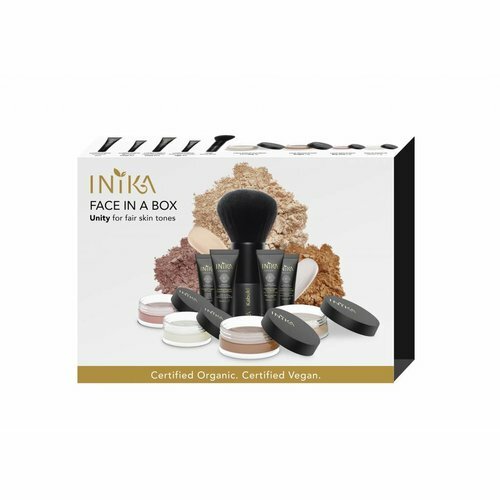 Inika Face in a Box Starter Kit!